My favorite DIY projects are those that incorporate natural materials or are upcycled in some way. This DIY clock has a little of both. 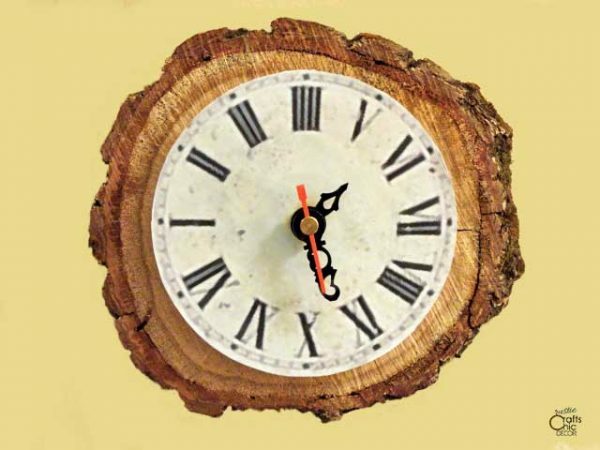 A rustic tree slice makes up the base of the clock. And, the face of the clock is upcycled from an old CD. I was even able to upcycle a little more by using an old clock for my clock parts instead of buying a clock kit. Basically, this entire project could be free, depending on what you have. Although making your own clock may sound intimidating, this particular project is actually a lot easier than what you would think. You don’t have to cut wood for your clock base or anything. So, wood working tools are not necessary. For this clock, I used a CD and clock printable for the face of the clock. You don’t have to put on a traditional face if you don’t want to. Leave the wood slice plain or attach metal number decals either around the whole clock or in a few strategic places. You can also paint or stencil the numbers or even use Dominos or other game pieces. 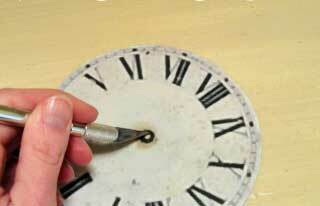 If you are upcycling an old clock, then you need to take the mechanical parts out of it before you begin. Of course, if you are using a clock kit you can just skip this step. I was able to take apart an old clock with just a Phillips screw driver and a wrench. I used a free printable for a CD clock face. The one I used is no longer available but I found another free printable that you can use from Print Free. Once I printed it off, I attached it to an old CD with decoupage. Then, I used an Exacto knife to cut a hole in the center of the paper through the hole of the CD. 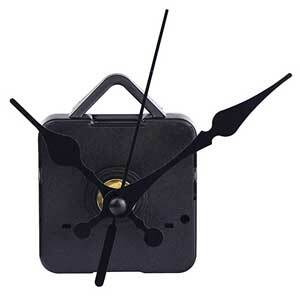 Attach all of the working clock pieces to the CD clock face. The mechanisms for the hands will fit nicely through the hole that is already in the CD. I ended up having to cut down the clock hands because they originally came from a larger clock. This was easy to do with tin snips. Attach the entire clock face, with mechanics attached, to a round tree slice. I simply attached the clock face with Velcro so that I could easily remove it to change out the battery. Line up the Velcro on the wood so that the clock face will be centered when attached. The clock face will set out from the tree slice a little. If you want the face to be flush with the wood, then cut out a notch in the wood with a router. 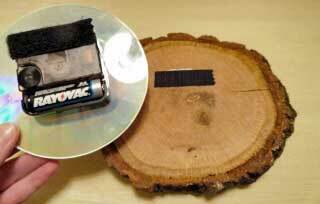 This allows the battery pack to sit inside the wood. You will still use Velcro to attach the clock face inside the notched out part. If you want to hang the clock on the wall, then attach a picture hanger to the back. You can also set this on a desk or table using a small easel. If you are interested in making your own DIY clock, you can purchase a variety of clock kits from Amazon. VERY cool Renee. I made a bunch of ornaments out using your CD tutorial but never thought to make an actual clock. That’s exactly what my husband did. He used his chain saw to cut several slices for me. Love this! We have our Kitchen Fun and Crafty Friday Link Party going on now and would love for you to share this!